At 5:33am I woke suddenly. What the hell was that? It sounded as though someone had trodden on a cat. The creature cleared its throat and tried again. Really? REALLY? I ran 39 miles yesterday and now I’m being woken up by a cockerel that can’t even tell the time? It’s not dawn and some of us have a full day ahead of us. I pulled my jumper over my head and tried to get back to sleep. It was no good. Now my bladder had woken up. Great. Wet wellies and a torch and a hunt for the loos. Bloody cockerel. Bloody bladder. Bloody camping. Bladder relieved I dragged myself back into my sleeping bag to wait for the alarm. Sigh. Why didn’t I book a hotel? Or check for cockerels before agreeing to camp? Camping had seemed like such a nice idea when I’d booked this race in my nice warm house. My phone bleeped with a message from Angela: “I’m at breakfast. Where are you?” I dragged myself out of the tent and helped myself to scrambled eggs and beans for breakfast in the pub. In my pyjamas. It appeared to be the uniform of choice for the runners at that time of the morning. Breakfast eaten, we registered for day 2. Still in our pyjamas. It is only 7:15am. An unholy hour after a long day running in the rain. Surely we could have had a bit of a lie in? I left Angela and another runner chatting in the pub and went to tape my feet and de-pyjama myself. I sorted my kit and laid out my snacks to pack and was halfway through taping my right foot when the siren went for the race briefing. Huh? I hopped out of the tent half-taped and listened in. Angela was there. I’d have to rely on her to catch any critical info. I hopped back to the tent and started shoving things panickedly into my ultra vest. Argh! I’d thought 45 minutes was plenty to de-tent and de-pyjama – rookie error!! I started pulling out tent pegs like a loon, while trying to put trainers on and doing half a job of everything. Argh!! People are leaving for the start!! Pull out tent pegs faster! Angela came over and we started de-tenting and her husband came over. I grovelled and he agreed to take the tent down – phew!! She was right. But I HATE being late. We passed the walkers and caught up to the runners. There didn’t seem to be as many people as before. Maybe the rumours flying around of the 50% dropout rate for day one had been correct. My hat and waterproof jacket were still drenched from the torrential rain yesterday. There had been no point in bringing them as they were sodden. I was going to have to rely on the weather forecast – which is a gamble in this country – and run today’s race in a base layer and run vest. Unfortunately my overpacking hadn’t included a wind proof jacket. Sarah – you idiot. I hope this doesn’t come back to bite you. Checkpoint 1 was at Maylandsea but the first section of the run was back to the sea wall so we took full advantage of being able to get lost while we could. We took a wrong turning and saw wild peacocks in a field. Unafraid they looked at us and carried on pecking and sauntering. This morning was a complete contrast to yesterday. There was mist in the fields and the sun was promising warmth. It was beautiful. A good-to-be-alive day. I took photos – I couldn’t resist. The sun was reflecting in the pools and everything looked so lovely. Even the broken stiles were something to laugh at as we clambered over them with our stiff muscles. As we arrived at checkpoint one, I needed a loo stop and Vaseline – things I hadn’t been able to sort due to my late start. We could see Maldon in the distance for a long time and in the sunshine, it looked picturesque and beautiful. It always helps me to see the destination ... even if that destination is still several miles away on the mazelike seawall. We could tell we were getting closer now though as we were sharing the sea wall with dog walkers and families. Hurdling Labradors and avoiding toddlers took our minds off the sea wall and the path improved closer to the towns and villages. As we came to the park, the runners in front went right. We checked the route instructions and followed the path around the left of a park despite a helpful elderly gent telling us to cut across – well that’s not playing by the rules is it? As we exited, we spotted the group of runners coming along the sea wall from our right. Looks as though the instructions gave us the shorter route. We came down the promenade and spotted the now familiar Saltmarsh quill flag waving in the slight breeze. Angela spotted a couple of her friends, Laura and Soraya and her husband, David, cheering us in. It was lovely to meet them and Angela’s husband yet again proved his loveliness by handing me a massive tub of Vaseline. Angel. Having run approximately 50 miles in the last 24 hours I had lost all sense of shame and grabbed a handful of the greasy gold and liberally applied it. Relief. Blessed relief. We grabbed our jelly babies (I did wipe the Vaseline off first!) and I dragged poor Angela away and on towards our next destination, the road stretching onwards in front of us. Angela was doing brilliantly, she was well past her longest distance run, but she was still smiling and chatting. There are extreme highs and lows in ultras as everything is magnified due to the distances. Small niggles become big ones, a small chafe becomes very uncomfortable very quickly and forgetting to eat or drink for just an hour can make for an uncomfortable latter part of a run. However we were here, running on a beautiful day and we were going to finish this. As we ran on the smooth promenade, passing the tall ships and pretty buildings of Maldon, the church bells rang out from the church on the hill, encouraging us forwards. We had been told to watch out for The Hill which was apparently a ”sharp climb up from Hythe Quay”. Again this was from the point of view of someone who lives at sea level. Even for me who lives in flat Warwickshire, this wasn’t a hill. It was a bump. We had a bit of a moment about which road to take but Mark from Tiptree Runners caught us up and showed us the right way to go. We ran with him for a short time before he disappeared then caught him back up on a rocky footpath. He ran this route from work so was very familiar with it. Our next checkpoint was just 3 miles away. It was a café next to the water at Heybridge Basin and operated by the world renowned Wilkin & Son jam makers. Unfortunately I didn’t get to taste any of the goodies although the ice cream sign had me wishing for a longer stop but we needed to keep moving. As we left the checkpoint, I chatted to another lady leaving ... who I realised I recognised. It was Lucy who had run the Stour Valley Marathon in June at the same time as Angela and I. She had pipped me and Chris to the 2nd lady position due to her better grasp of LDWA instructions and map reading and I recognised her from congratulating her after that race. It was nice to have a quick chat with a familiar face and she carried on slightly in front of us when I stopped to add a plaster to my growing collection of plastered sections. The next part was 4 miles to Goldhanger and a quiet section with views of Osea Island and Northey Islands and an endless succession of caravan parks. It was strange as the caravan parks were separated by massive houses ... and then more miles of caravans. We’d had a succession of short stops to checkpoints, with the final 2 sections being the longest of the day and making up 18 miles between them. We came into the quiet checkpoint knowing that no matter what we would finish now. There was only 18 miles between us and the finish line of the 75 mile event. It was a hot day but we were staying hydrated and making sure we were eating every half an hour. I went off to find the loo but Angela proved she could still race and beat me in there, casually announcing on her way out that she’d used the last of the loo roll. Thanks buddy. Huff. Luckily a search unearthed some more and I didn’t have to ask to borrow one of her socks. I came out and started sorting out vest, and daubing more Vaseline on (it’s ALLLL glamour this ultra running) and noticed Angela had got herself comfy with a cup of coffee and some sweets on the grass. We started chatting to Lucy there who announced she was dropping out – she’d had enough. We very bossily told her she hadn’t and asked her if she could run 10 miles – the distance to the next checkpoint. She confirmed she could, so we told her she could run it then. Poor Lucy didn’t know what had hit her as she got caught up in the Sarah & Angela whirlwind and we all decided we’d run together using a 12 minute run, 3 minute walk strategy. Angela offered me a sip of her coffee which I gratefully accepted before nearly spitting it out. She’d been drinking black tea and hadn’t even realised. Sigh. She’s lucky she’d got me around as snack and drink tester. I was conscious we were spending too long in the checkpoints. We were running at a reasonable pace, but wasting time stopping and chatting and scoffing jelly babies rather than grabbing them and carrying on. 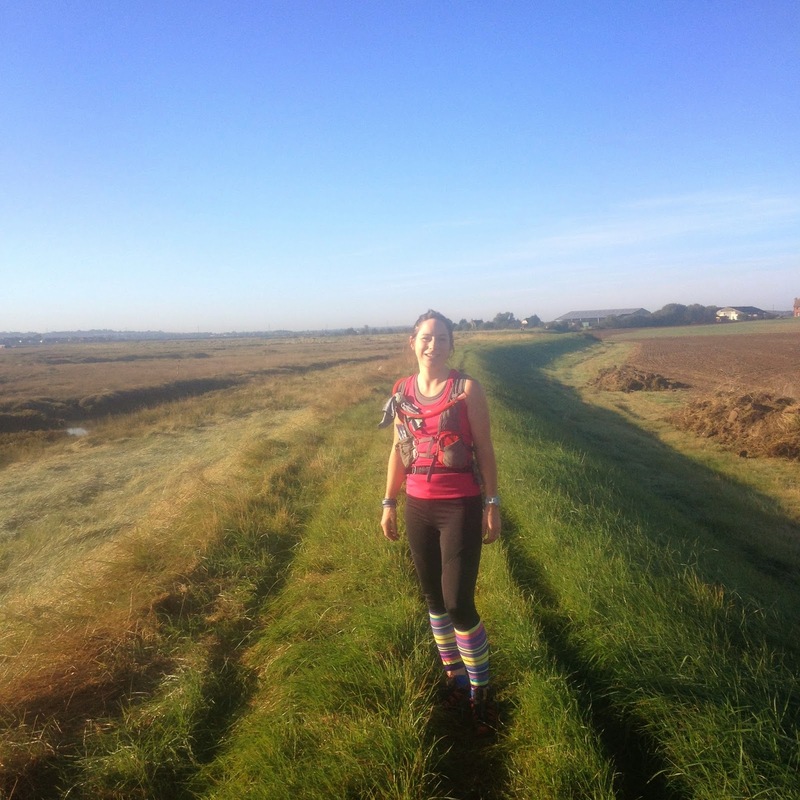 We set off along the sea wall, intent on running the 10 miles to Tollesbury, the ‘village of the plough and sail’. This section comprised mainly of sea wall, more seawall and broken stiles. It was a warm day and I was glad to be wearing just a vest and base layer under my back pack. We passed Kevin, the Stour Valley RD on this section, he’d been running steadily but the benefit of our run 12 minutes, walk 3 minutes was that we could keep our running paces reasonably consistent while being able to take advantage of the rest breaks. He had been in the distance on the sea wall for about an hour (the joy of running on a zig-zagging wall) before we passed him and had a quick chat at the same time. Angela and Lucy were running together but my running pace was slightly different to theirs so I carried on at mine and took an extra walk break while they caught up. I hate having to run at a pace that isn’t mine and this way I got an extra walk break. It seemed a win. Plus I could just enjoy the running and I could keep an earphone with music in while I listened for Angela’s bellowed ‘Walk!’, ‘Run!’ instructions. My other Garmin had died earlier today too so Angela was on timing duty. I owed a debt to Angela’s patience here. The urge to push me off the sea wall and into the marsh must have been almost overpowering as I asked her for the 23rd time that day how far we had to go to the next checkpoint, to run for, how far we’d been. She restrained herself. However, I suspect this may only because she was conserving energy. For the sake of not being pushed into marshes or beaten to death with my own trainers, I think it might be time to start saving up for a new GPS watch. We could see the Bradwell power station on the other side of the estuary. I was glad I hadn’t realised that it was here we would be running yesterday or I would definitely have called it a day. Especially if I’d known the other side was EXACTLY THE SAME. But that I’d have less snacks left. We could see the town of Tollesbury as we came towards it and it was exhiliarating knowing that we were nearly at the very last checkpoint. The paths became choked with dog walkers and families and we passed wooden houses on our left and what the instructions called an outdoor pool, but anyone else would have called a pond. We were on a smooth tarmac path winding down to the last checkpoint. Angela wanted to walk it but I checked with her and she was ok with me running into this one to get my water bladder refilled and jelly baby stash rejellied. Angela’s husband had a pint which my beer radar quickly noticed. It smelled amazing. I decided we needed to finish quickly and get our own. The marshals were pulling people off course and getting them checked by the paramedics due to sunstroke and we were warned not to proceed if we weren’t 100% as the difficulty of getting help to injured or ill runners on these sections would be high. What did they have out there? Bear traps? We picked up our final snacks and grabbed our maps for the very last section of Saltmarsh 75. Lucy had completely overcome her down patch at the last checkpoint and was good to run. I could sympathise as had had the same thing on Day one. I dragged Angela and Lucy out of the checkpoint (I swear the jelly babies are magnetic) and we were onto our last section. The last section was virtually identical to the 13 miles desolate stage on day 1. But with one difference. When we completed this 9 miles we could sit down. And not get up. And more importantly NOT have to run 38 miles the next day. There were still a lot of stiles to climb over, but now Angela was making funny noises as she climbed over these and when started running after a break. I very kindly took a photo of her to remind her of how much she enjoyed these stiles. I’m nice like that. This section also continued the 2-day theme of sea wall, more seawall and broken stiles. It was very desolate with the grassy mound winding between the marsh and the sea. It was difficult to see where our final destination was and there were no signs of life. We weren’t even seeing any other runners now and had no ideas whether we were last or first. There had been teams of relay runners flying past on both days early on but we hadn’t seen other runners for a long time now. Despite the solitude and monotony of the surroundings, I was on a high. I broke open the sweets and chocolate coffee beans and started shovelling them into my mouth and dancing to my music while trotting along. We were on 70 miles and my legs had finally woken up. I had snacks, the sun was shining, nothing hurt and in about 5 miles I’d be at the final checkpoint and there would be coffee there. A splash of white against the dark water and a pair of swans in the inlet moved serenely as we trotted through the Tollesbury Wick and Old Hall Marshes on the sea wall above them. We were nearly finished. Less than 5 miles of the route had been on surfaced paths - the rest had been grassed paths and across fields and it had been hard. Despite the flatness of the route, it had been a tough run. We could see the sea wall winding on ahead of us, broken only by occasional stiles and we could see some people. It was Lucy’s family! They had come to run her into the finish. What a wonderful thing to do. Lucy’s husband had started the run with her and would now be finishing it with her, but as Lucy said, he just missed out the 50 miles in the middle. Angela and I left her with her family and ran on towards the finish. And the sea wall ended. We ran down a path through a ploughed field, my mouth was still running too and I told Angela I would be practising my finish photo and doing ‘this’ (waving my ‘jazz hands’) and ‘this’ (‘jumping in the air’) and while looking back and chatting, my finish photo was taken ... 200m before the finish line. Never mind. We had seen the village hall which was the finish and I asked Angela if she wanted to run it in together with a final push. 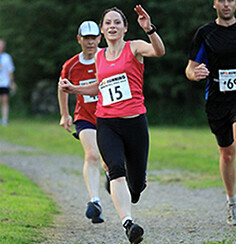 Angela didn’t and had spotted her husband by the finish. I left them together and ran it in. Angela arrived shortly after and we had the biggest hug. We’d made it through 2 tough days and come through it. Angela was smiling through her tears. She had done so well and I was so proud to run her first ultra with her. Lucy and her family came in to big cheers from us all and more hugs all round. We’d all finished a 75 mile run, survived sideways rain, resisted temptation of 5am cockerel murder, restrained ourselves from pushing friends into ditches after their Garmins conked out and made new friends. And now there was a massive jacket potato, a medal and multiple cups of coffee waiting for us. This has been a successful weekend. Ooft third lady! Impressed. Did you enjoy it in the end? Loved your honest and witty account of your Saltmarsh 75 experience! I am running it this year (my first ultra), at least I know what to expect now!